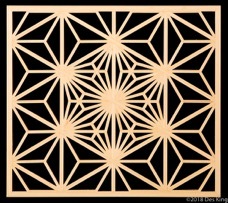 Kumiko classes are now available at my home workshop here on the sunny Gold Coast, Southeast Queensland. My workshop is small and I only have the facilities to teach one student at a time, so all classes are one-on-one; I will be with you instructing or assisting for the entire period of the class. Lessons are from 9:00am to 5:00pm, and can be arranged on days that are suitable to you — weekdays or weekends. There are no evening classes. The cost of each class is Aus $450 per day plus GST for a total of $495 per day — 2-day classes therefore cost $990 (incl. GST), and the 3-day class costs $1,485 (incl. GST). This includes all timber and other miscellaneous material used during the class. 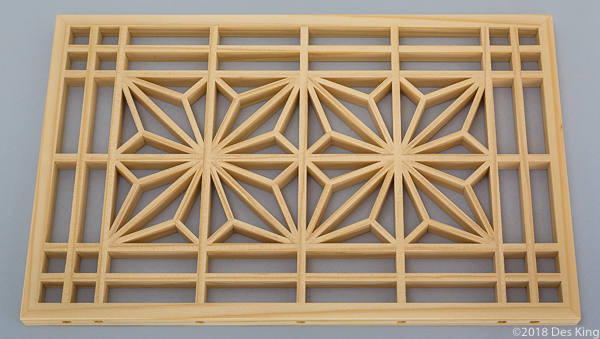 The jigs used in making up the patterns will be available for separate purchase. A $100 deposit is payable when making a booking for a class. All timber will be prepared by me to the correct dimensions before the class. 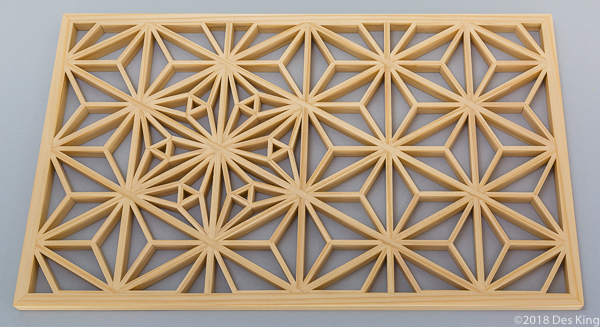 The only thing you have to do is learn how to mark, cut, trim and assemble the kumiko, tsukeko and patterns. Classes that are currently available are shown below. Please note that you will have to complete the basic square asa-no-ha class before you can move on to the intermediate hexagonal kawari asa-no-ha class, and you will need to complete this class before moving on to the advanced classes. All patterns — basic, intermediate and advanced — are made using only hand tools. You will not use any machinery whatsoever. You will cut all joints using a handsaw, and angles of the pattern pieces are cut using jigs and a block plane. So by the end of each class, your hand skills will have improved significantly. Class dates are completely flexible. I will hold the class when it best suits you, and there is no requirement to follow one class immediately with another. You can take any subsequent classes if and when you choose to do so. The only requirement is that you complete the basic class before the intermediate class. 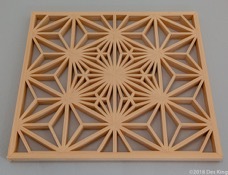 Tools: If necessary, you can use the tools I have at my workshop to make the patterns. It is preferable, though, that you have your own handsaw, marking knife, block plane, and 3mm chisel. For the advanced classes, you will need a 2mm chisel, but I will discuss this with you during the intermediate class if you intend to tackle the advanced patterns. For further information or to arrange a class, please contact me through the “Contact Us” page. In this two-day class you will make two square asa-no-ha patterns enclosed by twin kumiko and a tsukeko frame (photos on left). 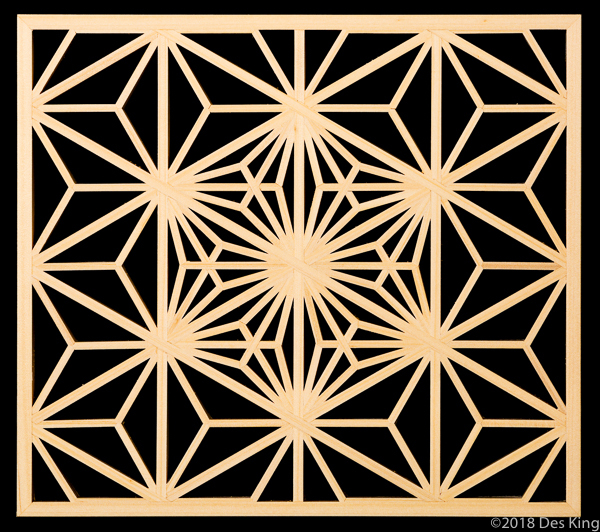 Here you will learn the correct names for the different parts of shoji and kumiko work, details and principles of kumiko marking, how to cut consistent gap-free kumiko joints with a handsaw, and how to mark, cut and attach the tsukeko to the project piece. The skills and knowledge you gain during this class will give you the solid foundation you’ll need to move on to the intermediate class and the much more difficult hexagonal patterns. 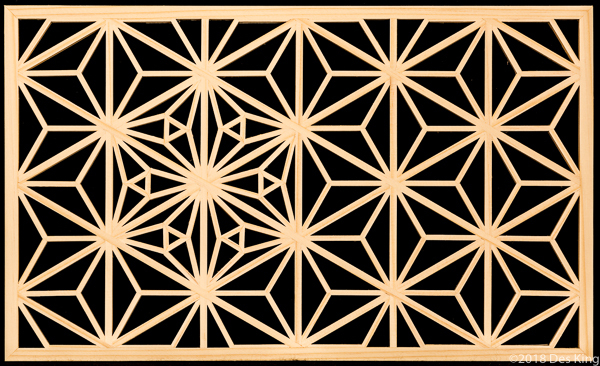 This three-day intermediate class is where we launch into the fascinating three-way joint (mitsu-kude) and the hexagonal patterns. You must have completed the previous basic class before you can begin this class. In this class you will make a hexagonal jigumi (lattice) into which you will cut and insert asa-no-ha patterns (including half patterns on the top and bottom) and a kawari asa-no-ha feature pattern (photos on left). Here you will learn how to mark and cut the three-way joint, how to cut the jigumi to size for attaching the tsukeko, and how to cut and attach the tsukeko. There is an enormous amount to cover in the three days, so you should be prepared to work solidly for the entire period. 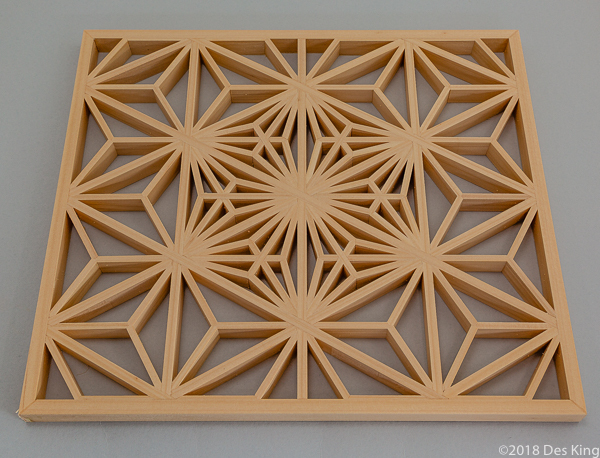 These two advanced classes are where we take kumiko work to the next level. Each class is for two days, and you must have completed the previous intermediate class before you can begin this class. These two classes can be taken in either order. 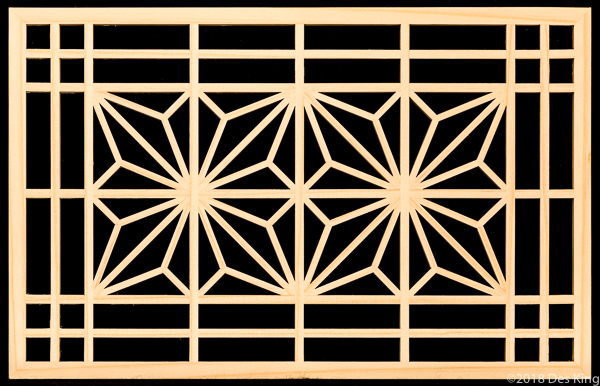 Here you will make a hexagonal jigumi (lattice) and insert the surrounding standard asa-no-ha patterns to reinforce the skills you gained in the intermediate class, after which you will learn to mark, cut and fit the featured pattern. 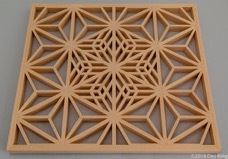 Once you have completed the two advanced classes with the two patterns shown in the left photos, should you wish to push yourself and tackle new challenges, I can offer new classes with many of the advanced patterns shown in the kumiko section of this website here and in my books. Some of these classes may require three days. 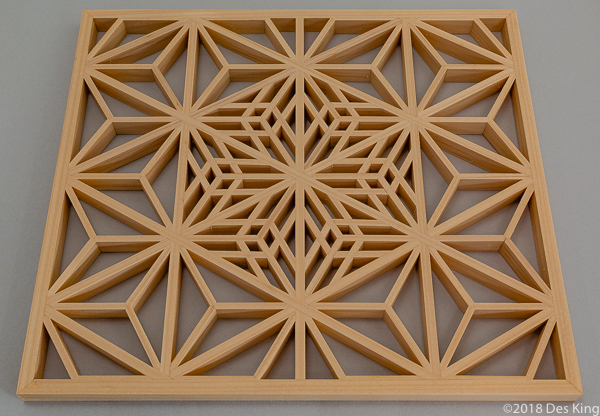 This is where the real fun with kumiko patterns begins.